I don't know about you, but I don't take near the care and preparation putting away my turkey gear as I do getting it ready before the season. I'm not sure if this is because I'm upset that turkey season is over or it's because I have so many "honey-do's" to catch up on that I just don't have the time. I think it's a combination of both! Either way it is import to inspect your calls and make sure they are in working order for the season ahead. In the months before the season I begin my rituals: going through my vest, watching old "Truth" turkey DVDs, reading and re-reading articles on Wild Turkey Report, day dreaming of past hunts, and reading The Tenth Legion by Col. Tom Kelly. Turkey Hunting is on my mind all year round but it becomes consuming at about this time of year. Since becoming a pro-staffer for a great call company, I never really had the knowledge of calls that I have now. There are quite a few things a hunter can do to make sure his calls are in tip-top shape before season and to even save their favorite mouth calls from one season to the next. Below I have described the methods that I use to keep my calls in shape. 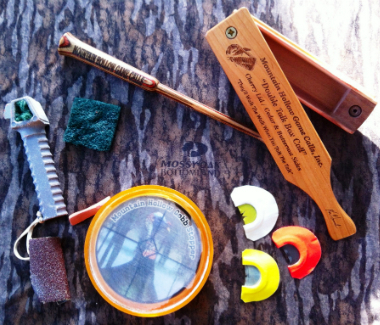 Box calls are a useful tool to a turkey hunter, almost essential. Box calls can be delicate at times, and build-up from debris or raised grain from a wet turkey hunt could be a cause for concern. Personally, I take a scotch brite pad and scuff down any areas where chalk is present. This gets rid of the old chalk and can even smooth out the wood surfaces for a fresh start to the season ahead. Notice, I use scotch brite pad, not sand paper of any sort. I lightly scuff the underside of the lid and each side board. Taking care while doing this will prevent loss or misshaping of any wood on your call. After I've done this and blown away any remaining dust, I give my call a good chalking with quality “schoolhouse” chalk. The next call that you'll find in just about every turkey hunters vest is a pot call and an assortment of strikers. Pot calls can be very durable as a whole but at times the surfaces need to be protected. It really all depends on what the surface is. Metal surfaced calls, such as aluminum and copper, are obviously extremely durable. Aluminum is non corrosive so there shouldn't be any issues there, but copper can oxidize a bit when exposed to water. If this occurs, a quick scuffing with your conditioning tool will take care of this. Other surfaces include ceramics and crystals, which are durable as well. Aside from cracks or chipping, these surfaces will sound like new after a good conditioning. I would personally consider glass and slate to be the least durable of the pot call surfaces. Glass could be easily cracked or gouged, hurting or ruining the calls sound. I inspect my glass call thoroughly for cracks or chips and give it a good scuffing with my conditioning tool to revive it. Slate produces some of the most realistic turkey sounds, but can also be the most delicate of surfaces. Slate can be cracked or "stained" easily. As long as a slate is not cracked it can be "revived" to call again. What I consider a stain would be a greasy old thumb print on the slate surface. Slate is a porous material, therefore it absorbs oils and moisture. I have found it possible to remove a stain by conditioning the call until you've removed enough material to where the stain is no longer visible. One must do this carefully because you want to condition the whole call and not just the one particular spot. Working one spot could produce a low spot in your surface thus possibly having an impact the sound produced. If possible you should check out the "glue" around the edge of your call that holds the surface in the pot. If this is coming free, it could have cause issues with performance. Also if possible check the sound board inside the call. This is somewhat difficult if the pot is wood, nontransparent, or has small sound holes in the bottom. A broken sound board will definitely change the sound of the call. When it comes to strikers, I try to keep the tips of them as clean as possible. Clean is important because material from the call surface will build up on the tip of the striker, preventing proper contact between the two. I simply rub the tip of the striker on a piece of scotch brite pad and that does the trick. I have seen some guys use a knife to scuff up the tip of the striker, and I would use caution when doing this. You should also inspect your strikers for cracks, splintering, or loose components (if a two piece striker). Mouth call maintenance is fairly simple. I have kept mouth calls in great condition for more than one season. I always rinse my mouth calls with water and give them a short soak in a water and mouth wash solution. This keeps them free of possible bacteria growth and I have to admit, at 5:00 am it's kind of nice to pop a call in your mouth that is minty fresh! Once they've soaked for a bit I dry them with a paper towel. I don't dry them out completely, as I don't mind them being a little damp. For long term storage I have heard of a couple different methods. Personally, I clean the mouth calls as mentioned above and store them damp in either the refrigerator or freezer. I have separated the reeds before and I have not at times. So far I haven't had an issue with the call performance either way. I do store them in an air tight Tupperware container. This keeps them from drying out if in the fridge and keeps things clutter free. I know my wife wouldn't appreciate a dozen little mouth call cases scattered about in the fridge or freezer. These are just a few things I do to help keep my calls in working order for next season or get them into shape before the season. I know that getting my calls out of my vest and working on them for a few hours helps to ease my spring fever during the cold winters here in New York. I hope that what I've written can do the same for you.